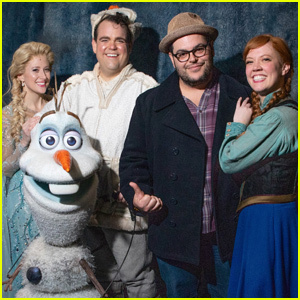 Josh Gad Stops By 'Frozen' Broadway Performance in NYC! 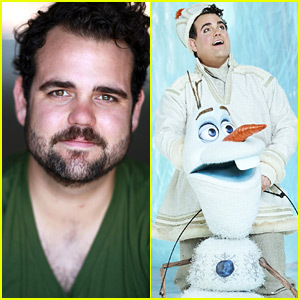 Josh Gad watched Frozen come to life on Broadway! The 37-year-old actor, who voices Olaf in the animated movie, stopped by a Broadway performance on Tuesday (November 13) in New York City. Josh posed for photos with the cast including Caissie Levy, Greg Hildreth and Patti Murin before gushing about the show. “This cast. Holy cow. This cast. This show. Thank you to the incredible cast and crew of #frozenbroadway for the magic and joy I witnessed tonight. I was truly blown away,” Josh wrote on his Instagram. 'Frozen' Broadway Cast Get Together To Promote Album at SiriusXM! 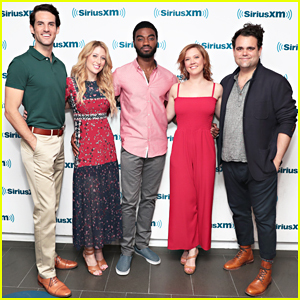 John Riddle, Caissie Levy, Jelani Alladin, Patti Murin and Greg Hildreth are all smiles as they take part in SiriusXM on Broadway presents: Curtain Call with Frozen The Broadway Musical at the SiriusXM Studios on Thursday (May 24) in New York City. The Broadway cast were joined by Tony-nominated songwriting team Kristen Anderson-Lopez and Robert Lopez, as well as moderator Julie James as they talked about the official Broadway cast recording of the musical. The album features all the songs you love from the movie, plus a bunch of new songs that were written just for the Broadway show, including Elsa’s “Monster” and Anna’s “True Love” – Stream it here! 'Frozen' Broadway Cast Album Stream & Download - Listen Now! The official Broadway cast recording for the Disney musical Frozen has arrived! 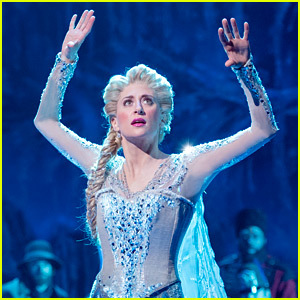 The Broadway cast features Caissie Levy as Elsa, Patti Murin as Anna, Jelani Alladin as Kristoff, John Riddle as Hans, and Greg Hildreth as Olaf. The musical is currently running on Broadway and the sold-out audiences will help it stay there for years. Download the album now on iTunes and stream below from Spotify. The new Broadway musical Frozen is now open and we caught up with Olaf actor Greg Hildreth to learn more about him! The actor uses an inventive puppet attached to his costume to achieve the Olaf look and you’ll totally forget that a person is standing there when you’re watching the show. Greg has previously been seen on Broadway in Rodgers + Hammerstein’s Cinderella, Peter and the Starcatcher, and Bloody Bloody Andrew Jackson. 1. I have 2 cats named Pigeon and Basil. 2. Popcorn is my favorite snack. 4. I grew up in Boston and have three sisters. 5. I drink too much coffee. Caissie Levy & Patti Murin Celebrate Opening Night of 'Frozen' on Broadway! Caissie Levy and Patti Murin walk the red carpet at the opening night party for Frozen: The Broadway Musical on Thursday night (March 22) at Terminal 5 in New York City. 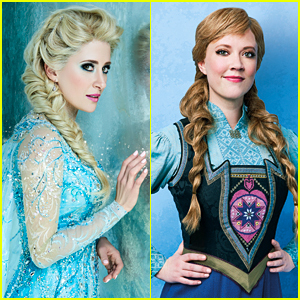 The Broadway vets are playing Elsa and Anna, respectively, in the new musical. They were joined at the event by their husbands, David Reiser and Colin Donnell. Also in attendance at the party were Jelani Alladin (Kristoff), John Riddle (Hans), and Greg Hildreth (Olaf), among others. Make sure to see all the production photos for the show and also watch the new trailer. FYI: Caissie is wearing a Zac Posen gown and De Beers jewelry. Patti is wearing a custom Christian Siriano gown with Fred Leighton jewelry. Colin is wearing a Brooks Brothers tuxedo. Jelani is wearing a suit by Musika Frère. Broadway's 'Frozen' Cast Pose for Portraits in Costume! The Broadway version of the musical Frozen is currently in the middle of preview performances and cool new portraits of the cast were just released! Caissie Levy (Elsa), Patti Murin (Anna), Jelani Alladin (Kristoff), Greg Hildreth (Olaf) and John Riddle (Hans) are pictured in the portraits shot by Andrew Eccles. Frozen, a full-length stage work told in two acts, is the first and only incarnation of the tale that expands upon and deepens its indelible plot and themes through new songs and story material from the film’s creators. Make sure to listen to the new song “Monster,” which is sung by Elsa in the show!